I am a huge fan of Shepherd's Pie having British heritage. It is a dish my grandfather and mother made often as I was growing up. Now you may know by now, if you are a regular reader, what a soup nazi I am. Actually I love making soups, for everyone. My slow cooker and dutch oven are my best friends, and help me out a lot. So with the love of Shepherd's Pie and the love of soup, how about a mash-up?! Add beef, carrot, celery, and potatoes and cook until meat is no longer pink. Make sure to break up beef in bite size chunks when cooking. This takes about 3-5 minutes. Stir in tomato paste, mustard, and Worcestershire sauce and cook until it thickens slightly. About 2 minutes. Add broth, pepper, salt and bring to a boil. Reduce heat, cover and simmer until potatoes are tender. This takes about 6-8 minutes. Stir in peas and cook about 1-2 minutes more. **Serving suggestion: Add warm Ciabatta loaves to the meal. I had Shepherd's Pie when I visited England, so I really want to try this soup. This sounds so good! Perfect for those cold days in winter or on a week you don't want to cook a lot. This would be great with ground turkey as well. This looks and sounds really good. A nice meal for a cold day. This looks like something I'd like to try with fall and winter just around the corner! And actually, it sounds good today--we are in a grey and rainy zone!! Need more spring!! I love shepherds pie but haven't heard of the soup. This sounds hearty and delicious! What a unique twist on Shepard's pie. It sounds delicious and would be the perfect meal on these cold winter days. I will be giving this recipe a try. 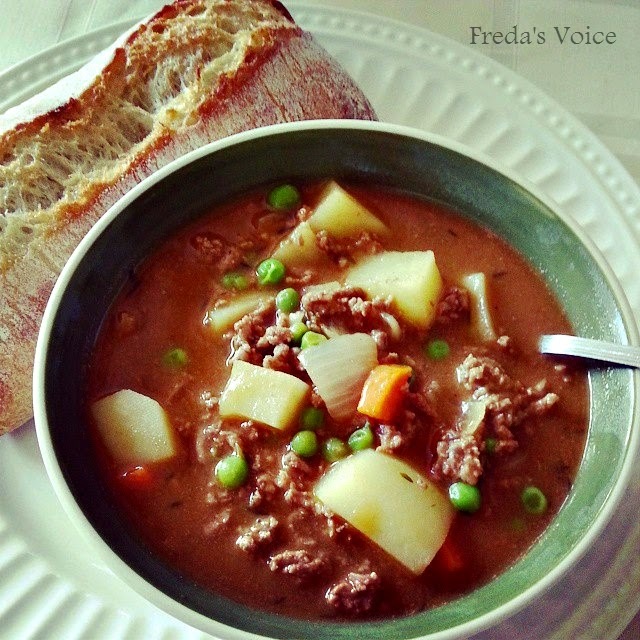 We love Shepherd's pie, but I have never considered making it into a soup! What a great idea, we do a lot of soups in the fall/winter/spring because its cold! Thanks for the recipe! Will add it to my bookmarks.